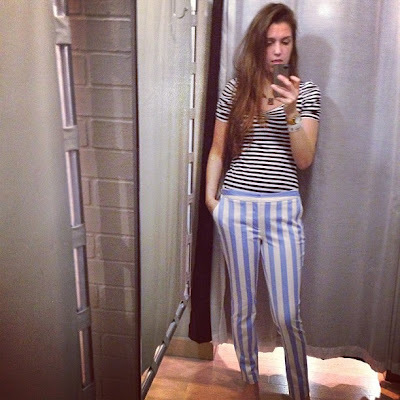 Look Sharp, Sconnie - Midwestern Fashion Nerd, Chronic Over-thinker: Striped Bellbottoms Are Cool Now. Striped Bellbottoms Are Cool Now. "I used to hate stripes." In fact, I'll admit that I'm still in the process of coming to terms with the "fabric made of two", as the bible (may or may not have) called it. Yet, acknowledging my longheld adversity piqued my interest, and I did some rigorous Google hunting to investigate the history of the questionably cool pattern. Turns out, stripes are like, super interesting. Most interesting, though, is that the "Parisian chic" blue and white stripe was met with DEATH in none other than that striped city itself. Apparently, stripes "had a diabolical quality, a demeaning and pejorative aura." 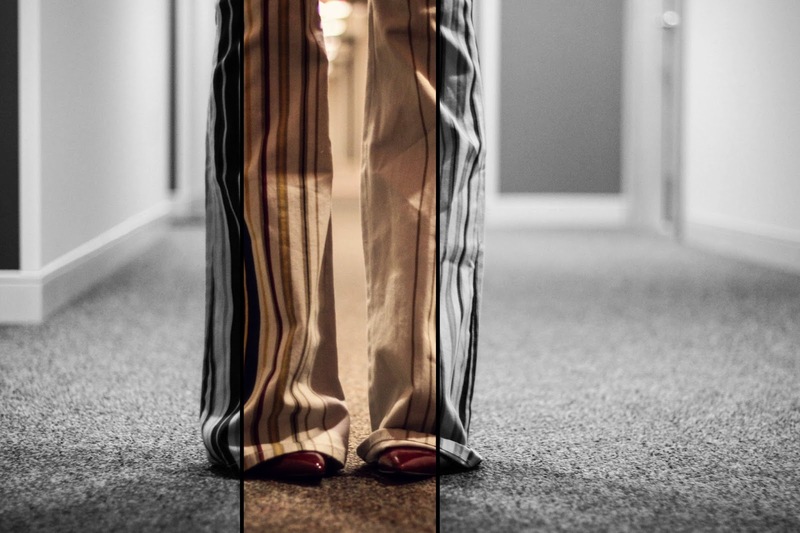 "Prostitutes, prisoners, clowns, hangmen and 'the condemned' wore the striped garment." Even zebras were considered evil. Then, as uncool things tend to do, stripes became cool. 18th century: Queen Victoria outfits her wee lad in an adorbs sailor suit. 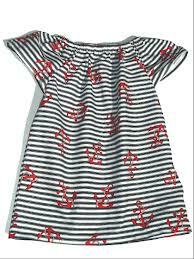 1858: stripes become naval uniform. 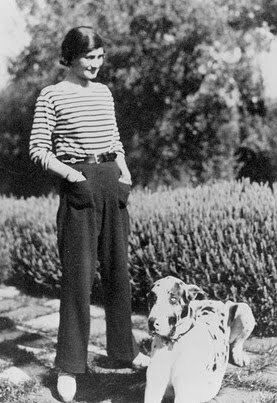 1930s: Coco like, totally nails a striped top with palazzo pants and BA BAM. Then came the era which I reference today. I mean, check these flares OUT. The fact that some random man had to die in Paris hundreds of years ago to make this here outfit possible doesn't exactly hurt either. It's like I'm channeling the soul of a super retro martyr. this brings me back to an outfit that i loved when i was in high school, my power outfit if you will. it was red and cream striped flares paired with a button down shirt with my dad's short sleeve brown tennis sweater circa 1975. for whatever reason, perhaps the rebellious 70s nature of the whole thing, i have never felt cooler. and you definitely look it in these shots so i know you get where i'm coming from. that second to last picture with your pants aflarin' and your hair a flowin', GORGEOUS. these are your power pants for sure. Love the pants!! Great look! Amazing pants, it look so great on you. These look cool on you! Bring on the bellbottoms. To be completely honest, if I saw these pants in a store I would dismiss them completely as I know they would be a sartorial monstrosity on me. BUT MY GOODNESS LADY, YOU HAVE CHANGED MY MIND. I love how they are so fun and nostalgic on you (your legs that go for aeons help too) and they are so unexpected. Indeed, they may be slightly diabolical but in the BEST WAY POSSIBLE. I love your style too. Wish I could be as chic as you! I love it! I love that you paired it with simple white tee! You look great! I would really really like to get in on this movement. I'm sick of skinny jeans. I mean, I continue to wear them, but I would like to put it out there that they're starting to feel STALE. The problem is that I am short and I think (gag me with a spoon for saying this) you might have to be tall to really and truly pull off the striped bellbottoms thing. Maybe? But then again since when have rules like that ever stopped me? You look like a move star from the 70s and I want IN, dammit.